December 10&12, 2015: I taught Indigo Shibori at Lake Forest High School as a visiting artist. The students made wonderful work! Preparation took so much time in my studio before the workshop because how to organize the time to use effectively. 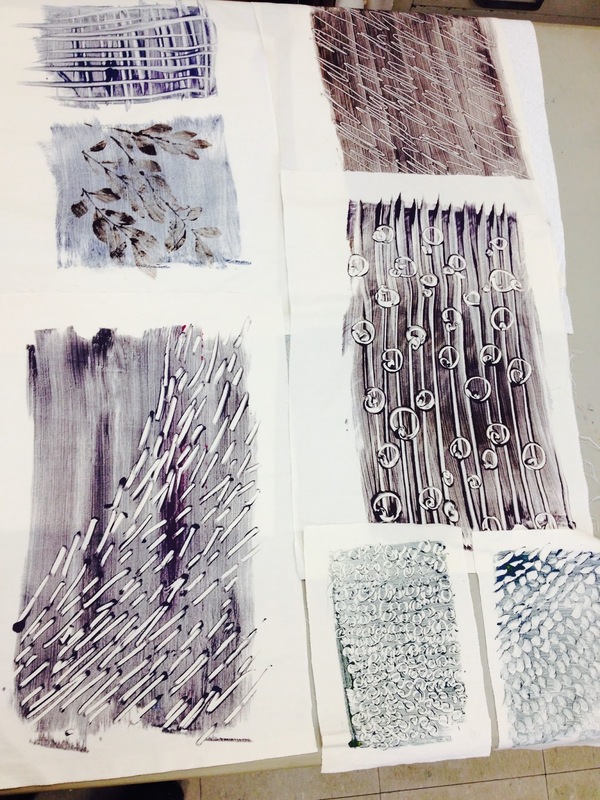 Also, Debbie Zare (art teacher) helped me to keep going in the class. 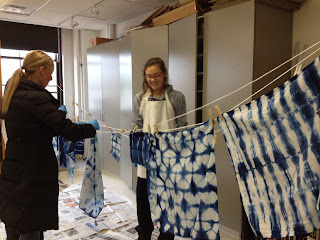 Actual workshop was short, even so, the students quickly understood how Indigo Shibori works. Thanks for this lovely experience. 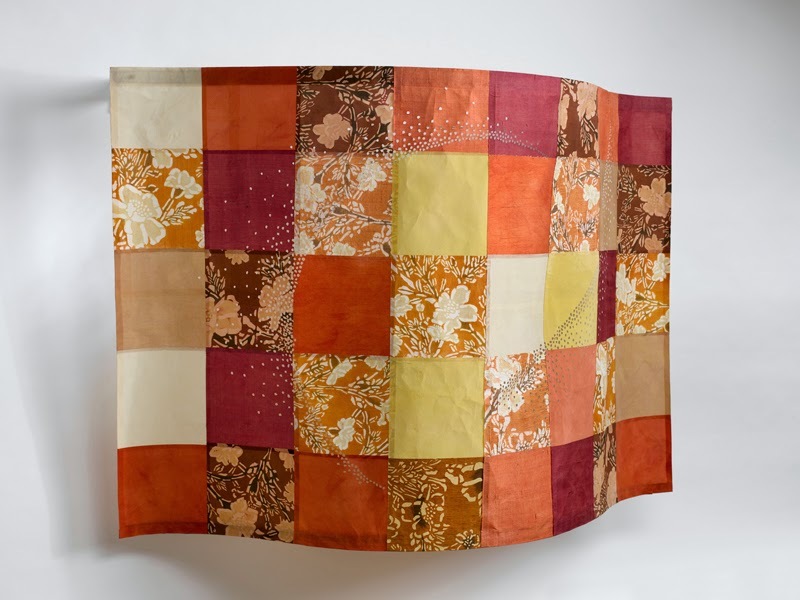 In Octber 2015, I was invited under sponsorship of the Joyce M. Wright Visiting Artist Program by Temari. 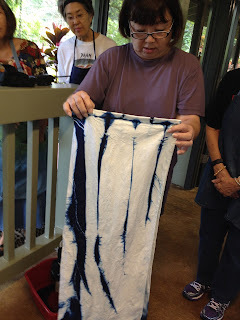 I taught "Stitching a Story" at the Honolulu Museum of Art School, and "Nejiri Indigo Shibori" at the Lyon Arboretum. 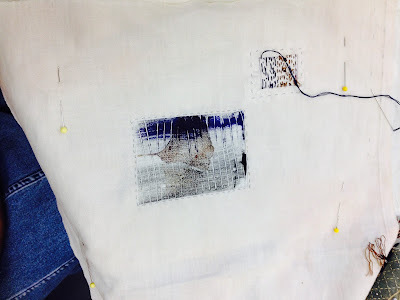 The workshop of "Stitching a Story" is to mono-print on fabric first, then stitch on the printed fabric. The students brought pictures, portrate photos for their inspiration. Stitching gives more tactic quality and focal point for the entire design. 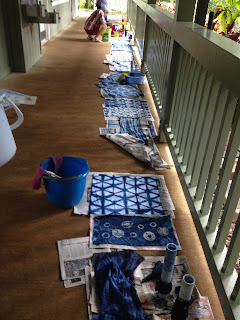 Nejiri Indigo Shibori was fun to explore because there are various ways to make interesting patterns. Full of green plants nicely matched with indigo blue at the Arboretum. It was beautiful place of Hawaii. 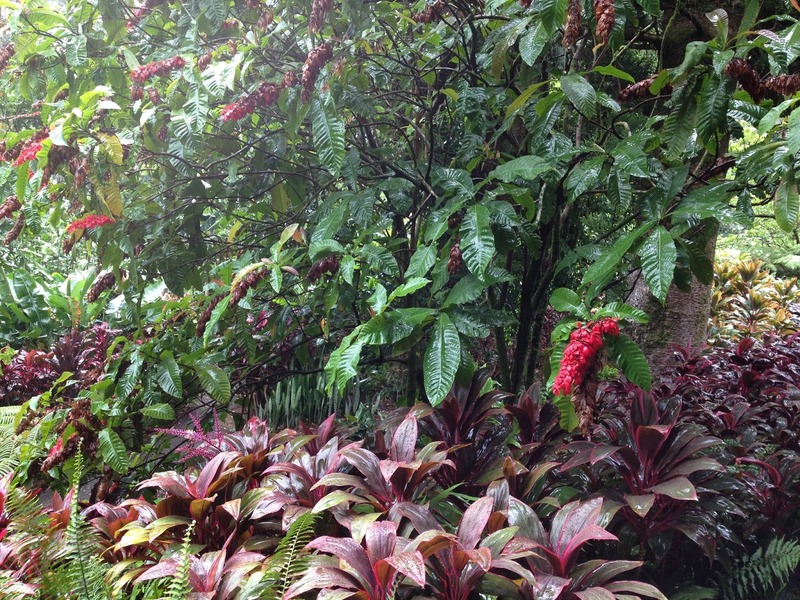 I felt exotic plants ans sunshine give energy and power for humans. People in Hawaii were very gently and relaxed. I totally enjoyed staying there. 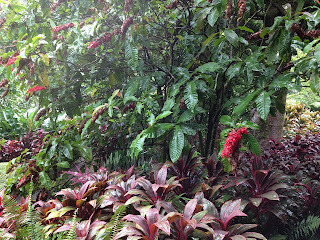 Lyon Arboretum: rain forest, beautiful plants and trees. I just returned from the teaching for the Shakerag Workshop. http://www.shakerag.org/workshops/2015/cohn/ It was a wonderful place; we could apply HARITE with Shinshi (traditional Japanese bamboo stretcher) outside. The weather was warm and sunny. The condition was perfect for katazome! 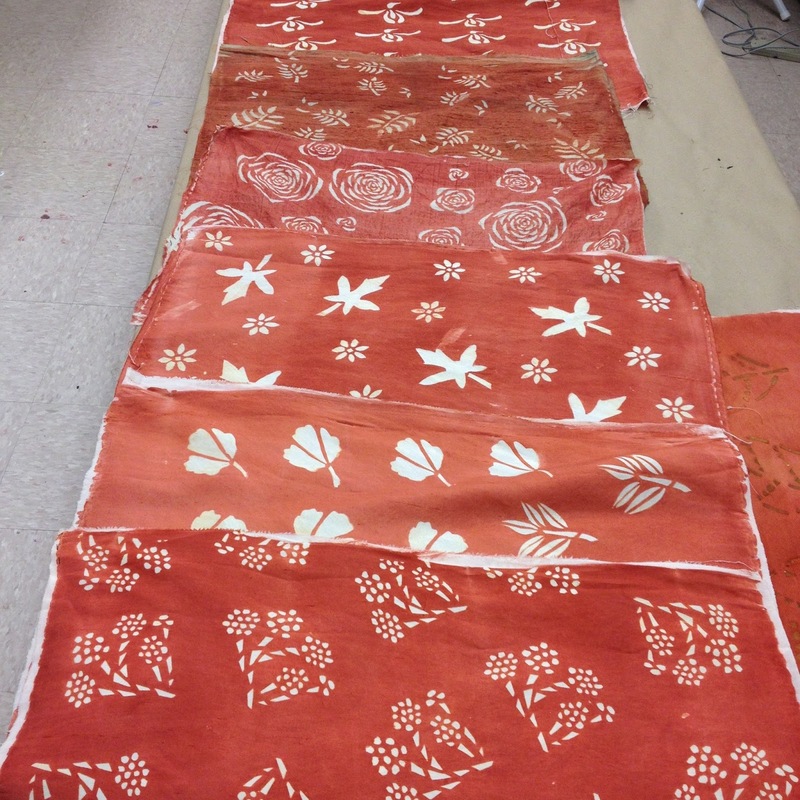 Katazome(rice paste resist) with Madder(natural dye) on silk. Student is brushing natural dye(LAC) on fabric. We used Harite with Shinshi outside. We also used mineal pigmements with rice paste resist. Drying fabric under trees. Katazome(cut-out stencil paper, ricepaste resist) with natural dye. 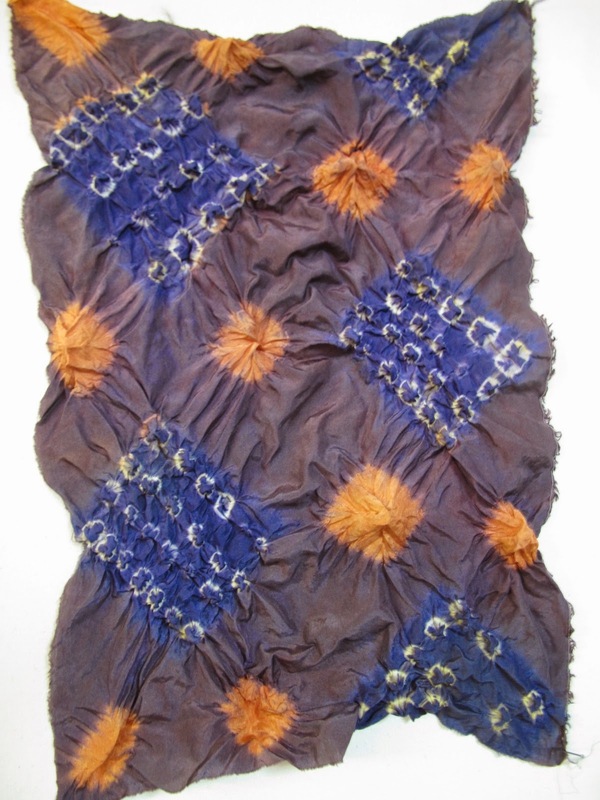 We sew pieces together on Harite then painted natural dye. It is on going process by Cara. Short crit: Kate is describing her pieces. (far above). All students worked hard and accomplished complicated processes of Katazome for five days. 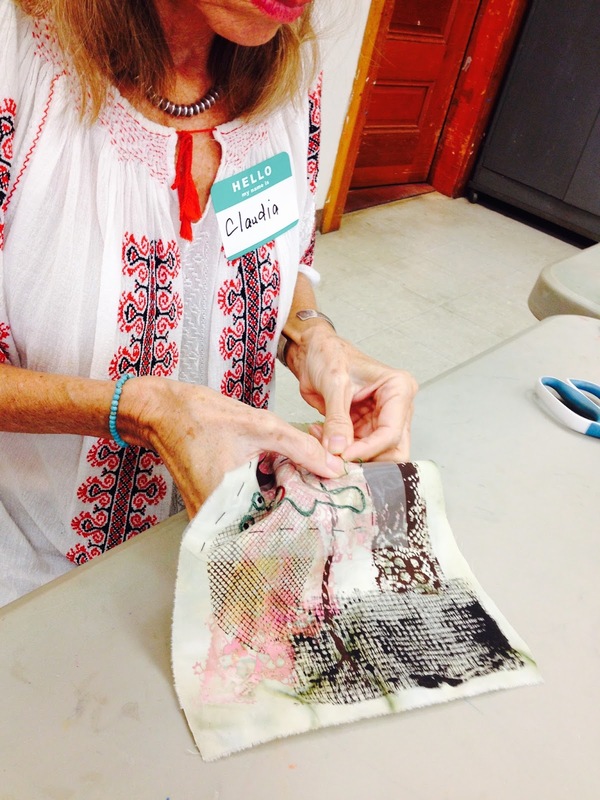 Eight artists from Lillstreet Textile Dept. participated through our critique group. We develpe the concept from traditional floral motif, then each artist interpreted her own way. It was curated by Camille Canales, Nora Renick-Rinehart, and Keeley Marie Stitt. I cut many dots for the Memory of Marigold #1. These indicate seeds. Seeds give life, creating a cycle of life for plants. The entire use of dots indicates a cycle of life to create a memory. Floweres are ephemeral and they live only a short time. 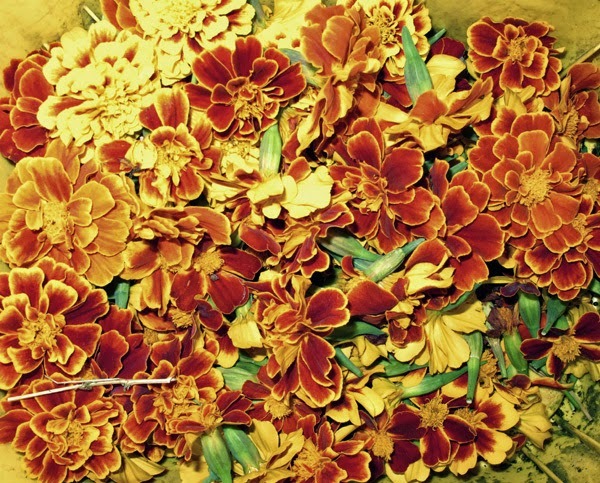 Dyes are extracted from live flowers, plants, and roots, such as Marigold, Apple tree, Osage, and Madder. 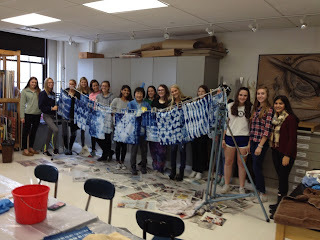 Silk fabric is then dyed with the extract. 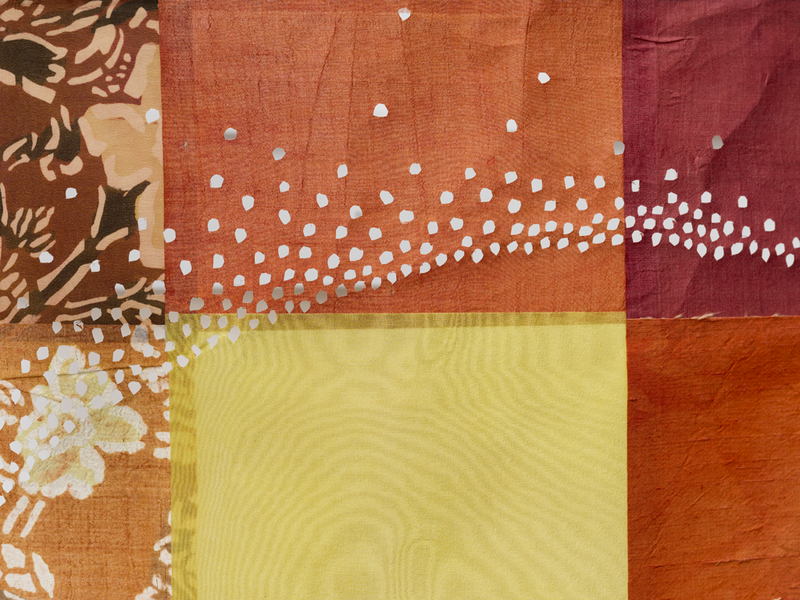 The extracted color will stay on the fabric. Even though the flowers are gone, the color will stay on the fabric as a dual existence. I will teach a workshop, Indigo Shibori and Natural Dyes at Pacific NorthWest Art School. July 29 - August 2, 2015 (five days) www.pacificnorthwestartschool.org 306-678-3396 ph. It locates on a beautiful Whidbey Iseland surrounding by ocean, near Seattle. 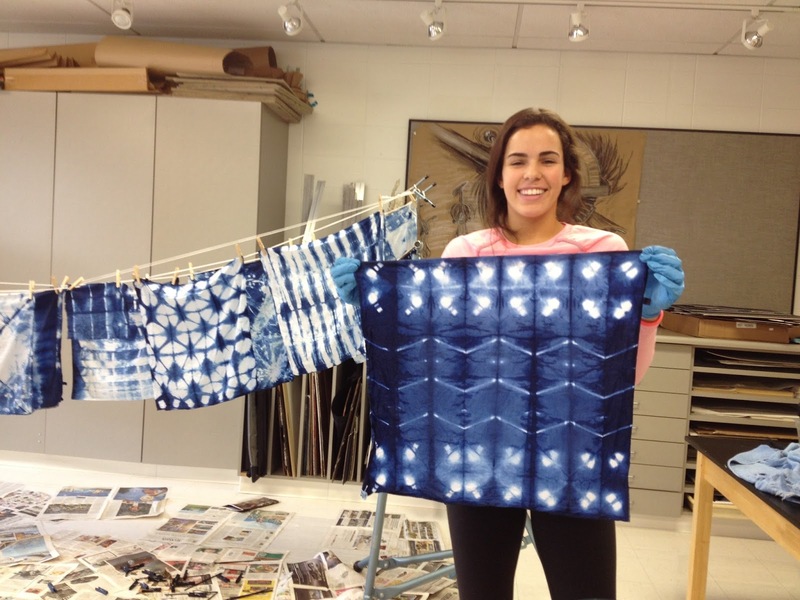 You will explore images on fabric with different shades of indigo blues and natural dyes, such as Cutch, Osage, Madder, and more. Various Shibori technique (stitching, wrapping, binding) will be experimented. Let's join and have a creative time! Nui (stitching) Shibori with Indigo with natural dye of Madder. After untied the above piece. The first day of students' work. 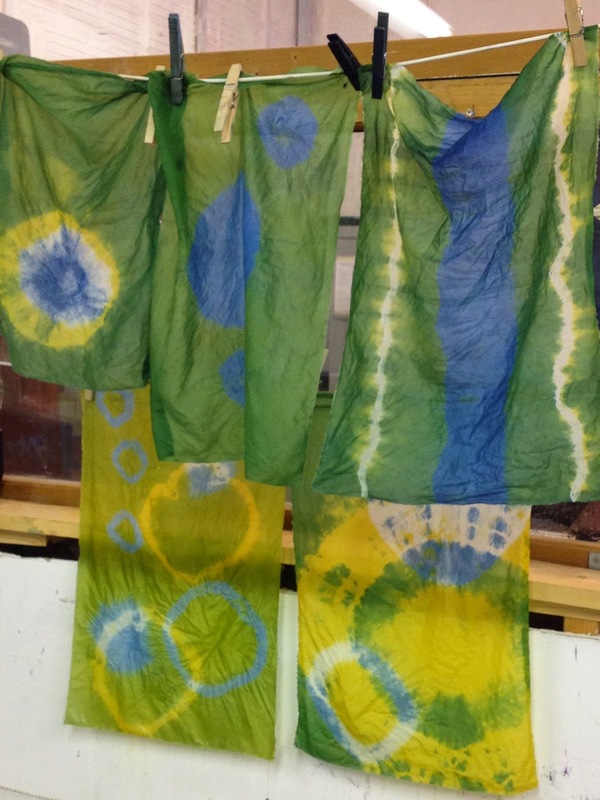 Indigo and natural dye (Osage) create GREEN!.